How to Make a Gypsy Costume. 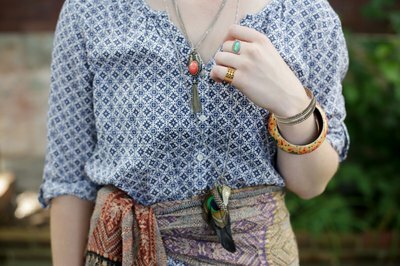 Bright colors and lots of jewelry make a female gypsy costume one of the most fun to create. At Halloween this standard is appropriate for all ages. Gather supplies from your closet or visit a nearby thrift store to pick up what you need. Easy and economical, make this outfit in a day using the following guidelines. Wear bright colors and many layers. 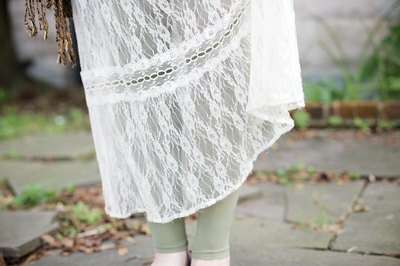 A long colorful skirt is great, but two skirts of different lengths layered together are even better. Gypsy women often wore bloomers. Leggings make a perfect substitute and are readily available in the store if you don't have a pair in your closet. 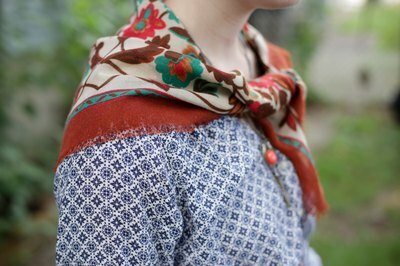 Add a ruffled and or lacy blouse as well as a patterned or solid color vest. It doesn't matter if they match or coordinate. Varied patterns and colors only add to the creative look of the costume. 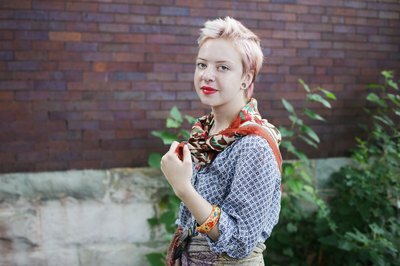 Use a long scarf for a sash and tie another one around your head. A fringed shawl looks great around your shoulders but is not necessary. Wear appropriate shoes, if possible. Sandals or flats work best. Apply bright red lipstick and blush to accent the face. Make an impact by wearing tons of jewelry. Big hoop earrings, layers of necklaces, bracelets and ankle bracelets add the final touch to this stunning gypsy costume. Look in your closet before you head to the store. You probably have most of the items to make this costume. Just be creative.